There is an uppity shopping mall in my city where all the rich people go to let the valet park their car for them and then hang out to show each other how pretentious they are. When we drive up to this mall (an infrequent occurrence to do brief business given the nature of this mall), the girly-girls see our Marine Corps stickers and paraphernalia, they whisper to their girly-man husbands (surely saying something like, “Eewww honey, make the bad people go away – they scare me”), and then they all cast cold stares our direction. My oldest son and I have a plan to deal with these people. We plan to put more Marine Corps stickers on our loud truck, back it up to the mall and rev the engine, blow exhaust into the crowd, play the Marine Corps hymn over loud speakers, and blow our train air horn until all of the “good” people have been scared away. In response to the Marine Corps being barred from filming a new commercial in San Francisco, I am drafting an amphibious assault plan to reoccupy the Socialist Republic of San Francisco for the United States. In yet another goofy display of self hatred, the Oakland airport is guilty of poor treatment of Marines. Michelle Malkin and Michael Ledeen give us the story. In short: “On September 27th 204 Marines and soldiers who were returning from Iraq were not allowed into the passenger terminal at Oakland International Airport.Instead they had to deplane about 400 yards away from the terminal where the extra baggage trailers were located. This was the last scheduled stop for fuel and food prior to flying to Hawaii where both were based. The trip started in Kuwait on September 26th with a rigorous search of checked and carry on baggage by US Customs. All baggage was x-rayed with a ‘backscatter’ machine AND each bag was completely emptied and hand searched. After being searched, checked bags were marked and immediately placed in a secure container. Carry on bags were then x rayed again to ensure no contraband items were taken on the plane. While waiting for the bus to the airport, all personnel were in quarantined in a fenced area and were not allowed to leave. The U.S. Senate confirmed the next commander of the U.S. Joint Forces Command in a vote here today. As USJFCOM’s commander, Mattis will pin on his fourth star and will be responsible for maximizing future and present military capabilities of the United States by leading the transformation of joint forces through enhanced joint concept development and experimentation, identifying joint requirements, advancing interoperability, conducting joint training and providing ready U.S. forces and capabilities – all in support of U.S. combatant commanders around the world. He will exercise combatant command of approximately 1.16 million personnel through his Army, Navy, Air Force and Marine Corps service components. NATO has also agreed to appoint Mattis as NATO’s Supreme Allied Commander-Transformation. I have been watching USJFCOM from afar for a while, wondering about the value added that their existence brings. Not denying, just wondering. With Mattis in responsible charge, I will not wonder any longer. They could not do any better than to get Mattis. … removed a fundamental aspect of counterinsurgency warfare that I had experienced throughout my year as a tactical battalion commander in Iraq: fighting. And by removing the fundamental reality of fighting from counterinsurgency warfare, the manual removes the problem of maintaining initiative, morale and offensive spirit among combat soldiers who will operate in a place such as Iraq … maybe we should stop, in a metaphorical sense, trying to eat soup with a knife in Iraq and instead go back to the basics and try eating it with a spoon. War is not clean and precise; it is blunt and violent and dirty because, at its essence, it is fighting, and fighting causes misery and death. The authors of the Army’s 1986 AirLand Battle doctrine premised their manual on fighting as the essence of war. Fighting gave the 1986 manual a coherence that reflected the true nature of war. The Army’s new COIN manual’s tragic flaw is that the essence of war fighting is missing from its pages. I cannot possibly hope to recapitulate the breadth or depth of discussion in the thread at the Small Wars Council, but would hasten to point out several things concerning the discussion now that the subject has become a little more ripe and the argument is slowing. First, I agree wholeheartedly with Gentile’s rebuke of the notion that counterinsurgency is “armed social science.” Second, concerning Dr. Metz’s statement that “we treat counterinsurgency as a variant of war not because that is the most strategically effective approach, but because we have been unable to transcend Cold War thinking,” I respond that counterinsurgency has been a variant of war since at least the Roman empire (which faced a Jewish insurgency in Jerusalem), or even before. In recent history, all one needs for proof of principle is the Small Wars Manual, published in 1940, well before the cold war. Every successful counterinsurgency operation in the Anbar Province has at least begun with heavy kinetic operations. Examples of kinetic and security operations preceeding reconstruction and rebuilding could be cataloged for weeks, but in the interest of brevity, only three will be given. Before Operation Alljah could fully engage Fallujah, approximately two months of kinetic operations producing many dead and detained insurgents was necessary in the outlying areas. Only after robust kinetic operations were completed could gated communities and biometrics be implemented. The Small Wars Manual has no such weakness (i.e., failing to consider warfare as part of war). There are so many references to infantry patrols, cash disbursements for intelligence gathering, distributed operations (independent patrols operating without communication with command), census information and knowledge of prominent citizens that they are too numerous to list. To have discussed distributed operations (although not called that by name) so early in doctrinal development of small wars is remarkable indeed! There is yet another discussion thread at the Small Wars Journal that convinces me that I must try one more time to explain the involvement that coalition forces should have with culture and religion in a counterinsurgency campaign. Much confusion swirls around this issue because, in part, people reflexively respond (a) by assuming that you are calling for a holy war, or (b) assuming that your mindset is one of a social scientist hunting for another lever to pull or button to push to cause certain reactions. The former category reacts to my modest proposal by denying that religion should have any role in how one man relates to another, with the later category honestly attempting to engage the issue, but as counterinsurgency professionals using ideas such as center of gravity and societal power structure. Neither camp really gets it yet. So let’s use two simple examples that might show how religion and cultural understanding might aid the counterinsurgency effort in Iraq. These examples are not meant to be sweeping or comprehensive, nor am I constructing doctrine in a short, simple little article. I am attempting to make this simple rather than complex. In the first example, I will imagine that I am a chaplain in Iraq serving U.S. troops. I will endeavor to ensure that the spiritual and life issues of the men under my responsible charge are squared away, but along with this, I approach my Commanding Officer and ask to arrange a meeting between the local Imam and me. The meeting is arranged, and begins with me thanking the Imam for meeting with me, and telling them that even though I am Christian, I am very impressed by the ‘smartness’ of the Kalam cosmological argument, and that the Islamic scholars who teach this have reason to be proud. We share food and talk about family, and then I request that he teach me something of his faith. The reason, I share with him, is that I want to ensure that the men who represent the United States act with honor. There will be many cultural and religious things of which they are unaware, and families, the man of the house, and women might take offense to actions behind which there was no intention of causing such a reaction. He can tell me things that he would not say to the Commanding Officer, I tell him, and he can trust me with confidentiality. I will work with the CO or simply with the men, but work I will, very hard, to ensure that no offensive action is taken that would violate the religious sensibilities of his people. I know that this can work, since a national religious conference has already occurred, put on by the Department of Defense at the request of Muslim clerics who approached our Chaplains as fellow holy men. I am but a single Chaplain, but I believe that I can take the intent behind the national conference and apply it at a local level. Finally, I end my meeting with the Imam by requesting a series of meetings so that I can learn his faith and work with him and his people to ease their suffering to the extent that I am capable. In the next example, it is the year 2004 and Sadr is in the custody of U.S. Marines (the Marines of 3/2). I know that there is a large group of Shi’a who are moderate, and in fact, many Sunni look upon them as uncommitted Muslims. I also know that many see the Sunni as hardened Muslims who follow the Salafist or Wahhabist jihadist traditions. But as a religious man who has his attenna up with these things, I know that these generalized views can lead to very wrong conclusions. I know that the Sunnis of Western Iraq are much more secular than the Sunnis in Saudi Arabia, and want none of the radicalism of the hard line schools. Recently slain Sheikh Abdul Sattar Abu Reesha was a chain smoker whose hands would have eventually been cut off by the jihadists to stop him from his smoking. On the other hand, I know that Sistani has not yet met with coalition forces or representatives of coalition forces because we are the “great Satan.” Likewise, Sadr is a believer in a form of radical Shi’ism that comes from the Mullahs in Iran, and can be trusted only to subvert a stable Iraq that allies with the West against religious extremism. I manage to convince coalition authorities not to release Sadr. In this example I manage to use my knowledge of religion to diagnose which sect can be trusted and which cannot. Such can be the results of a religious understanding between coalition forces and the people of Iraq. This understanding can be there if it is not contrived or forced, as some sort of tool of counterinsurgency appealing to societal power structures or centers of gravity in order to persuade the Iraqis to do something or be a certain way for us. I am in favor of honest and open dialogue in military matters concerning the enemy, and likewise in matters religious and cultural. 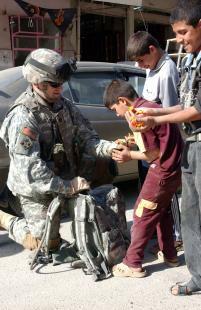 Chaplain (CPT) William Johnson, the 1-8 Combined Arms Battalion chaplain, gives candy to Iraqi children on the streets of Balad. See also Chaplains as Liaisons with Religious Leaders: Lessons from Iraq and Afghanistan. On September 20, 2007, in V-22 Osprey Deploys, I linked a Marine Corps Times article on the Osprey deploying. Actually, much earlier, on one of my many trips to Jacksonville, N.C. and Camp Lejeune, I had considered contacting the Osprey program manager for an article on the (at that time) soon-to-be-deployed aircraft, and perhaps catch a ride on one of them. I regret not having taken advantage of the proximity to this aircraft to get a ride in one, but perhaps I would not have been allowed to anyway. Around the time that I published this little article, W. Thomas Smith, Jr., published on the Osprey at The Tank, and then it took literally days for main stream media outlets to pick up on the story. It is with some humor that I read the subsequent reports. Thomas Smith and I published on this well before any other outlets. Milblogs beat them to the punch. 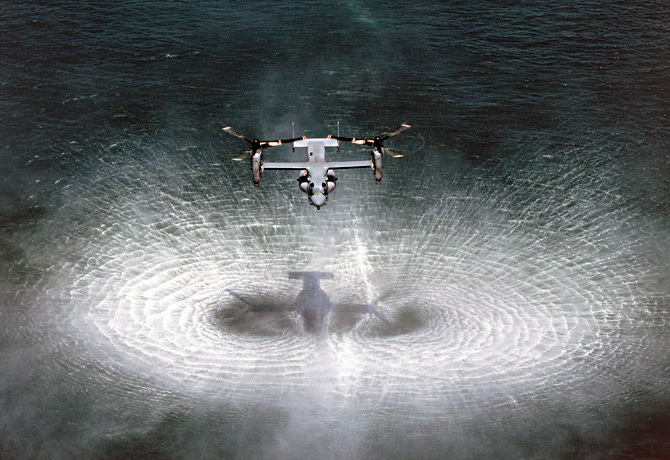 Time has an article entitled V-22 Osprey: A Flying Shame that slams the V-22. Now the aircraft that flies like an airplane but takes off and lands like a chopper is about to make its combat debut in Iraq. It has been a long, strange trip: the V‑22 has been 25 years in development, more than twice as long as the Apollo program that put men on the moon. V‑22 crashes have claimed the lives of 30 men — 10 times the lunar program’s toll — all before the plane has seen combat. The Pentagon has put $20 billion into the Osprey and expects to spend an additional $35 billion before the program is finished. In exchange, the Marines, Navy and Air Force will get 458 aircraft, averaging $119 million per copy. There is much more at the link above. The trouble with this article, though, is that it is old news. It simply rehashes known and tired information to make a new opinion piece. The better approach would have been to plan a true investigative article by following the V-22 to the Anbar province, board the aircraft along with the Marines, and write stories from Iraq about its failure or success. I would do it (i.e., go to Iraq and get the story). As I said in my first article, the proof of the aircraft will be in its deployment. Advocates and critics alike should wait for the data. It will succeed or fail, and no article can change the field data. I am ambivalent at this moment. I love the A-10. I believe that helicopters are dangerous and always have been, lumbering through the battle space while vulnerable to fire (it isn’t by accident that the helicopter in Vietnam was called a “flying coffin”). The Osprey has its advantages (speed, altitude) and its disadvantages (it needs a secure landing zone, which means that helicopters will probably not go away in the near future). The fact that the Osprey program was problematic and expensive is old news. Predictions of failure in deployment are premature. The goal should be to avoid sensationalism and get the real story. In The Anbar Narrative: Part 1, I provided an excerpt from a speech by Major General John Kelly on the counterinsurgency campaign in Anbar. By all accounts, it was a magnificent, well-executed and hard fought campaign, with each city and area of operation being slightly to significantly different from the others. Adaptability and improvisation have marked the effort all across the province. Like I have argued before concerning the necessity for a military blow to al Qaeda to enable the awakening, while pointing to the significance of the population turning against al Qaeda, he also sets the necessary backdrop for this. There is no question that the campaign was a military victory, but it is helpful to hear all perspectives, even contrary viewpoints. In The Daily Star, Muhammad Abu Rumman published a commentary entitled “Deconstructing Iraq’s Sunni armed groups,” in which he gives an alternative perspective. Although there have been ideological and political struggles among armed Sunni factions in Iraq since the beginning of the occupation, until recently they were kept quiet. In early 2007, differences came out into the open in the form of warring public statements between the Islamic State of Iraq (a coalition including Al-Qaeda) and the Islamic Army in Iraq, exposing previously unacknowledged animosity. As the two groups went at each other in the media, other Sunni groups began a complicated process of splintering and reformation. The 1920 Revolution Brigades split into two military factions, Fatah and Jihad, with Fatah later reclaiming the 1920 Revolution Brigades name. Hamas-Iraq, which emerged as the first armed movement to build political and media institutions parallel to its military activities, joined forces with the Iraqi Resistance Islamic Front. In early May 2007, the Jihad and Reform Front was formed, incorporating the Islamic Army in Iraq, the Mujahideen Army, and the Sharia Committee of Ansar al-Sunna (which split from its mother organization, Ansar al-Sunna), with the Fatiheen Army joining later. Then in early September seven factions, including the 1920 Revolution Brigades and the Al-Rashideen Army, joined forces to establish the Jihad and Change Front. This period of upheaval has left four main blocs in the Iraqi Sunni resistance: first, Jihadist Salafism, which is an extension of Al-Qaeda. This bloc consists primarily of the Islamic State of Iraq and is close to Ansar al-Sunna as well. Second, nationalist Salafism, which observers believe toes the Saudi Salafist line and receives material and moral support from abroad. The groups in the Jihad and Reform Front belong to this bloc. Third, the Muslim Brotherhood trend, mainly Hamas-Iraq and the Resistance Islamic Front. Observers believe it is associated with the Islamic Party, which participates in politics within the Iraqi Accord parliamentary bloc. And fourth, the nationalist Islamist trend, including the Jihad and Change Front groups (such as the 1920 Revolution Brigades and Al-Rashideen Army). This bloc is ideologically close to the Brotherhood trend and is considered an extension of the Association of Muslim Scholars, the leading group of Iraqi Sunni clerics. While keeping the players straight is admittedly difficult, it is important to understand why Sunni groups are experiencing such turmoil. Two factors – US discussion of withdrawal from Iraq and genuine ideological and political differences among Sunnis – can explain what is taking place. First, signs of American military failure and the rising chorus of voices in Washington calling for withdrawal have changed the focus of Sunni insurgents. As militants sense that a US withdrawal is approaching, defeating the occupation has lost primacy as a goal in favor of maneuvering to fill the power vacuum in the post-occupation stage. In this context, several factors have fueled tensions among resistance factions. For example, the Islamic State of Iraq (Al-Qaeda and its allies) has not only tried to spread its influence among the other factions, it has also demanded that many faction members pledge allegiance to its emir, Abu Omar al-Baghdadi. At the same time, Arab countries (particularly Jordan and Saudi Arabia) have begun to worry about who will fill the power vacuum after the US withdraws. Such countries are concerned about preventing the dual threat of increasing Iranian influence and the rising power of Al-Qaeda in western Iraq, the latter of which constitutes a clear and direct threat to their security. Second, there are genuine ideological and political disagreements – mostly centering on questions of nationalism and religious ideology – among armed factions. The Islamic State of Iraq employs a universalist rhetoric, and is more concerned about defeating the US occupation and waging a war of attrition than agreeing on the nature of a new Iraqi political system. These groups’ close ties with Al-Qaeda’s central command give them a broad agenda, whereas the goal of other Sunni factions is essentially confined to bringing about a US withdrawal from Iraq. On political-religious ideology, the Islamic State of Iraq also adopts a more uncompromising rhetoric than the other factions on key questions such as attitudes toward the Shiites. The Jihad and Reform Front also takes a hard-line position on the Shiites, though less so than groups affiliated with Al-Qaeda. The Jihad and Change Front groups, meanwhile, see their priority as defeating the US occupation, although they do not conceal their concern about Iranian ambitions in Iraq. Regarding what should come after the US withdrawal, the Jihad and Reform Front seeks to establish rule by Sharia (Islamic law). For their part, the Jihad and Change Front groups say they would allow a popular consensus to determine democratically what type of political regime would prevail. Several ideas give this analysis away as propaganda. First, the statement about the “American military failure” is so over-the-top absurd that it calls into question the credibility of the author and remaining analysis and casts some degree of doubt on any usefulness that it might have. The surge and security plan has thus far been militarily successful, but aside from that, the surge had nothing to do with the Anbar campaign. The seeds of security were planted in Anbar long before the surge was ever conceived, and in fact the surge can rightly be said to be modeled after the Anbar campaign. If there is any failure it would be the internal political machinations in Iraq, but that is no fault of the U.S. military. Second, the statement about the “rising power of al Qaeda in Western Iraq” forces us to wonder exactly where the author has been the last year. Al Qaeda resides in the suburbs and surrounding small towns of Baghdad (such as Tarmiyah) and to the North and Northeast of Baghdad in the Diyala Province, but can find no safe haven in Anbar. Their last haven in Anbar, Fallujah, was taken from them in Operation Alljah. If for no other reason, this analysis is helpful for the current breakdown of the Sunni insurgency as he sees it, and for understanding the propaganda value of calling the counterinsurgency campaign a “defeat” for the U.S.
A complete stand down of U.S. forces seems to be what the insurgency not only wants, but sees on the horizon. Their plans appear to have been crafted around just such an eventuality, and if the U.S. obliges the insurgency, the military gains – however magnificent they have been – may come to no avail. In Concerning Snipers, Rules of Engagement and General Kearney, we discussed sniping being mainly an offensive operation, a notion fairly well removed from the framework of rules for the use of force and rules of engagement which focus on force escalation and allowable responses for self defense and force protection. The Washington Post published an article today that is sure to turn heads and educe the righteous indignation of the establishment. A Pentagon group has encouraged some U.S. military snipers in Iraq to target suspected insurgents by scattering pieces of “bait,” such as detonation cords, plastic explosives and ammunition, and then killing Iraqis who pick up the items, according to military court documents. The classified program was described in investigative documents related to recently filed murder charges against three snipers who are accused of planting evidence on Iraqis they killed. From a tactical standpoint, this would seem to be a fairly dubious approach, meaning that we cannot see a way to gauge success (perhaps an insurgent is picking up the weapons for the purpose of harm to U.S. forces, or perhaps rather than an insurgent, he is the head of a family picking up ammunition for the purpose of use with the single AK-47 he is allowed to have for self and home defense – how would we know?). However, here at TCJ, we smell a rat. Will enlisted men and lower level officers go down for programs born and nurtured way above their rank? Soldiers said that about a dozen platoon members were aware of the program, and that numerous others knew about the “drop items” but did not know their purpose. Two soldiers who had not been officially informed about the program came forward with allegations of wrongdoing after they learned they were going to be punished for falling asleep on a sniper mission, according to the documents. Army officials declined to discuss the classified program, details of which appear in unclassified investigative documents and in transcripts of court testimony. Criminal investigators wrote that they found materials related to the program in a white cardboard box and an ammunition can at the sniper unit’s base. There is the rat that stunk so badly, served up to us from an “Army spokesman.” Of course there are no programs authorizing the “murder” of local nationals. Sniping the enemy is not murder. The responsible low level officer explained exactly the purpose of the weapons, i.e., as “bait.” Whether this is an effective approach can be debated (we called it dubious). But the argument has been framed by the “Army spokesman” in a way that presupposes that no one in higher levels of leadership would have approved this and thus these men concocted the tactic all on their own. It must be the fault of the lower ranking officers and enlisted men, the “spokesman” implies. As for placing items near the bodies of alleged insurgents to justify kills, the story gets somewhat murky. Spec. Jorge Sandoval and Staff Sgt. Michael Hensley are accused by the military of placing a spool of wire into the pocket of an Iraqi man Sandoval had shot on April 27 on Hensley’s order. The man had been cutting grass with a rusty sickle when he was shot, according to court documents. The military alleges that the killing of the man carrying the sickle was inappropriate. Hensley and Sandoval have been charged with murder and with planting evidence. As Sandoval and Hensley approached the corpse, according to testimony and court documents, they allegedly placed a spool of wire, often used by insurgents to detonate roadside bombs, into the man’s pocket in an attempt to make the case for the kill ironclad. One soldier who came forward with the allegations, Pfc. David C. Petta, told the same court that he believed the classified items were for dropping on people the unit had killed, “to enforce if we killed somebody that we knew was a bad guy but we didn’t have the evidence to show for it.” Petta had not been officially briefed about the program. In The Sniper of Tarmiyah, we advocated distributed operations and latitude for snipers to engage insurgents even if they were not brandishing a weapon or actively engaged in hostilities (this leaves a significant amount of latitude to the shooter and his NCOs who need to be trained to make these judgments). So under our schema, the “evidence” would never have been necessary and thus would not have been “planted.” To be clearer, while at TCJ we doubt the effectiveness of a plan that baits insurgents due to lack of certainty of who has been killed, we support the idea of snipers being given latitude to shoot outside of the strictures of self defense. The Pentagon doesn’t buy into our schema, and so we are left with snipers feeling as though they need to “justify” kills in order to save themselves from prosecution. In the end, who will pay for this program? Vela’s father, Curtis Carnahan, said he thinks the military is rushing the cases and is holding the proceedings in a war zone to shield facts from the U.S. public. Certainly not the brass. Let’s be clear here about what is happening. In Concerning Snipers, Rules of Engagement and General Kearney, we provided a link to the book White Feather, the authorized biography of Marine Gunnery Sergeant Carlos Hathcock who had 93 confirmed sniping kills in the Vietnam war, more than any other in military history, and who to this day serves as an inspiration from the grave for all new sniper trainees in the Army and Marines. Carlos Hathcock is the shining example of distributed operations. He was alone in the field for long periods of time, his decisions were tried and true, his investment in the kill extreme, and his knowledge of the enemy impeccable. This is the model for sniping, and as a military tactic, it brings risk – and conversely, very high payoff. While not all snipers will be equivalent to Carlos Hathcock (perhaps none will), the problem is that we are witnessing the end of sniping as a military tactic. The rules of engagement prevent targeting the enemy in Iraq or Afghanistan if they do not fall within the precise stipulations (e.g., self defense, engaged in hostile acts, etc.). Within the current framework, we may as well end the sniper schools and rely on standard service rifle training of infantry. The number of sniping kills due to defensive operations doesn’t justify the expense of the schools. The military establishment knows that many of the kills by past snipers such as Carlos Hathcock did not meet these stipulations. They know that there has been a sea change in the cultural acceptability of these necessary military tactics, and use of them – or failure to punish people who use them – could be career-ending for top brass. In this case, the top brass is running for cover and the lower ranks are left hanging out to dry, even when their plans were approved by top brass. Carlos Hathcock may have been heroic and an interesting and admirable artifact of military history, but sadly, his day is coming to an end. In a Multinational Force update on Friday, September 21, 2007, Rear Admiral Mark Fox conveyed positive developments in Tarmiyah. The Senate voted today on the General Betray Us add sponsored by MoveOn. The Senate voted Thursday to condemn an advertisement by the liberal anti-war group MoveOn.org that accused the top military commander in Iraq of betrayal. The ad became a life raft for the Republican party as the war debate kicked into high gear. With several Republicans opposed to President Bush’s war strategy, GOP members were able to put aside their differences and rally around their disapproval of the ad. Sen. Gordon Smith, one of the few Republican senators who supports legislation ordering troop withdrawals, told reporters Thursday he thought Petraeus’ testimony and the MoveOn.org ad were the two biggest factors in keeping Republicans from breaking ranks with the president: Petraeus’ testimony because it was persuasive and the MoveOn add because it went too far by attacking a popular uniformed officer. “It was stupid on their part and disgraceful,” said Smith, R-Ore. The resolution condemning the ad was sponsored by conservative Republican John Cornyn of Texas. Voting against it were Democratic presidential hopefuls Sen. Hillary Rodham Clinton of New York and Christopher Dodd of Connecticut. Sen. Barack Obama of Illinois, another contender for the Democratic nomination, did not vote, although he voted minutes earlier for an alternative resolution by Sen. Barbara Boxer, D-Calif. That resolution condemned the MoveOn ad as an “unwarranted personal attack,” but also condemned political attack ads that questioned the patriotism of Sen. John Kerry, D-Mass., and former Sen. Max Cleland, D-Ga., both Vietnam veterans. So there you have it. After accusing General Petraeus of being a liar (“the willing suspension of disbelief”), Senator Clinton voted against a resolution condemning the slanderous add by MoveOn. Senator Obama was too cowardly to vote. A slanderer and a coward, both enjoying remarkable success as candidates for President. These are indeed proud days for the republic.